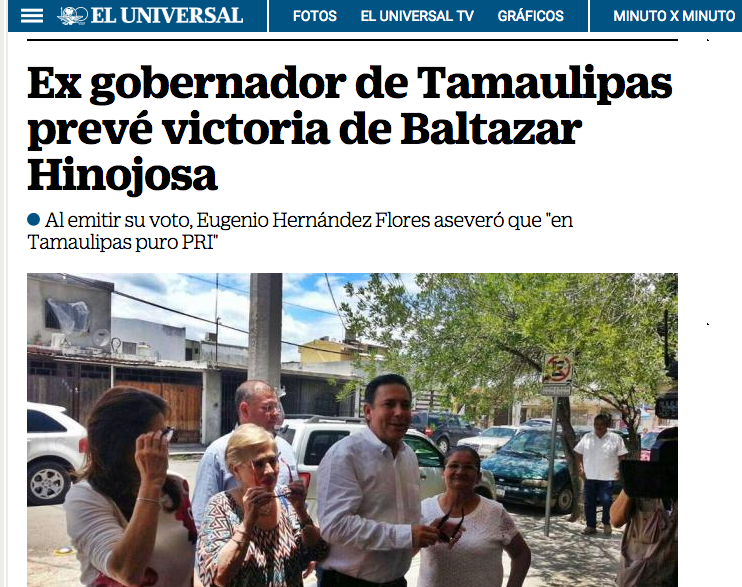 One of Mexico’s Largest newspapers, El Universal, has revealed the influential power of Mexican politics when it praised a former Tamaulipas governor while forgetting to mention that he is currently a fugitive of the U.S. Department of Justice. As Breitbart Texas previously reported, Eugenio Hernandez Flores who served as the governor of Tamaulipas from 2005 to 2010 currently a fugitive of U.S. law enforcement on money laundering charges. He is also listed on the website of the U.S. Drug Enforcement Administration. 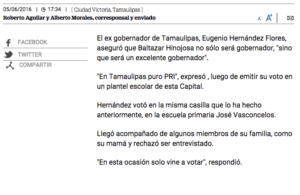 Even though he is wanted by U.S. federal authorities, Hernandez made a public appearance on Sunday when he walked to a polling location and, in front of a sea of reporters, praised his party and his friend Baltazar Hinojosa, the now failed gubernatorial candidate. Both Hinojosa and Hernandez belong to the Revolutionary Institutional Party (PRI) a political group with a long history of corruption and ties to drug cartels. 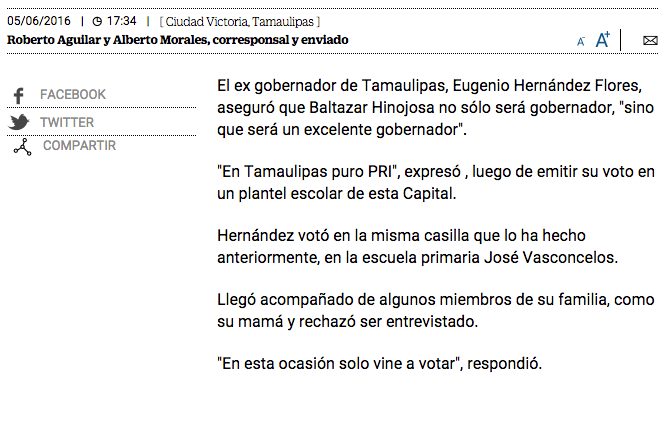 In one of the multiple election day stories published by Mexico’s El Universal headlined “Ex-Tamaulipas Governor Foresees Victory of Baltazar Hinojosa,” reporters Roberto Aguilar and Alberto Morales wrote a positive story on Hernandez about his trip to the voting poll with his mother and family members, but forgot to mention that he is a fugitive from justice. 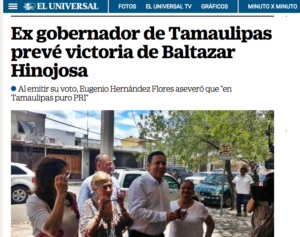 El Universal is the same publication that last week rushed to defend Hinojosa and misled their readers after Mexico’s Proceso, Sinembargo.MX and Breitbart Texas each published stories about an ongoing investigation by the U.S. Treasury Department over the candidate’s use of shell companies and about money laundering. In an effort to defend Hinojosa, El Universal reported that Hinojosa was not on a list published by the Office of Foreign Asset Control, and that the Treasury Department did not provide information about individuals not on that list. However, what El Universal failed to tell their readers is that the OFAC list is only used for drug cartel kingpins and terrorists. 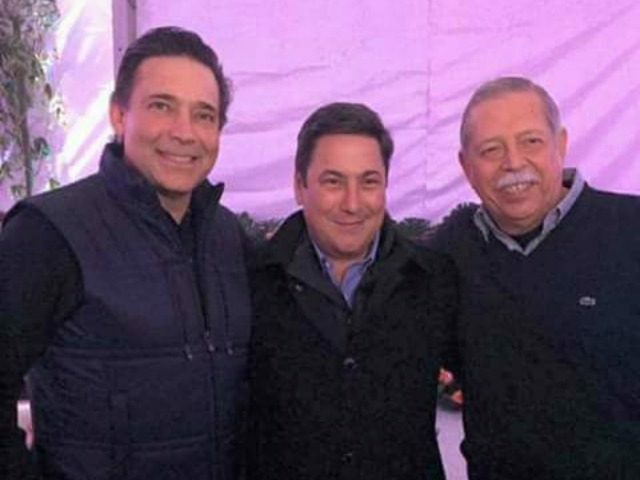 The two former governors of Tamaulipas who are fugitives from justice, Eugenio Hernandez and Tomas Yarrington, are also not mentioned on the OFAC list since they are not drug kingpins or terrorists.